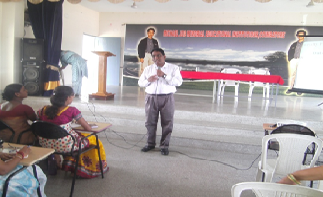 Michael Job College of Arts and Science for Women organized a Faculty development programme on 17th April - 2015 for the teachers those who are working in Michael job Matriculation Higher secondary school, Michael Job college of Education and Michael Job College of Arts and Science for Women. This was an initiative by Dr.Lali Thomas, Principal and her team. The resource person for this programme is Dr.G.Ravindran, Assistant Professor, Department of Commerce, Chikanna Government Arts College, Tirupur. 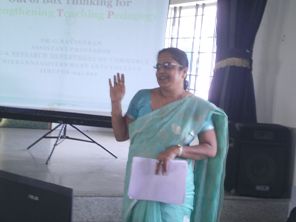 The topic of this programme was “Out of box thinking for strengthening teaching pedagogy”. The programme started at 10.30am with prayer song followed by Mrs.S.Ponnammal HOD/AP/Department of English, MJCASW, welcoming the gathering. After the lunch break he started session with activity based teaching. 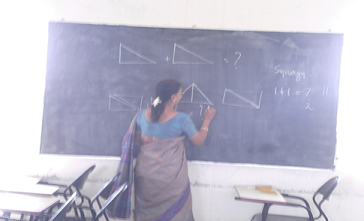 Teachers participated actively in this session and they enjoyed this session very much. The teachers learned skills like Critical thinking and Problem Solving, Creativity and Innovation, Oral and Written Communication. The session closed by 3.30pm.